Sunday 6th July – Ship Ahoy! The story so far… My name is Bugsy Bennett. 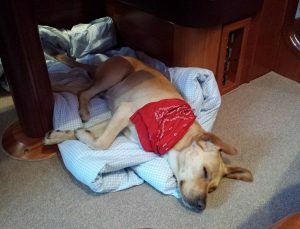 I am a friendly 5 year old Springador (Springer X Labrador) about to set out on a sailing adventure round the British Isles in a boat called Saltpot, with my owners, Mark and Karen. It’s day 1 of my first big sailing adventure and I am quivering with excitement. I certainly feel the part; Bugsy the buccaneer, eager to set sail! But my toffee coloured fur and chocolate button eyes are a magnet to people and pets, so it takes an age to get going. 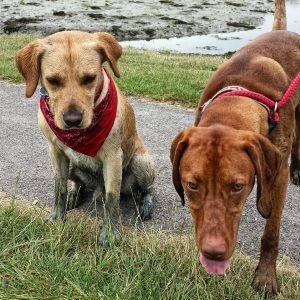 Having got down and dirty with my new playmate Harper the Hungarian Vizsla, (we can’t take stowaways) I am cleaned up and kitted out for adventure. We finally cast off from Gosport late morning for the first leg of our Journey to Brighton. 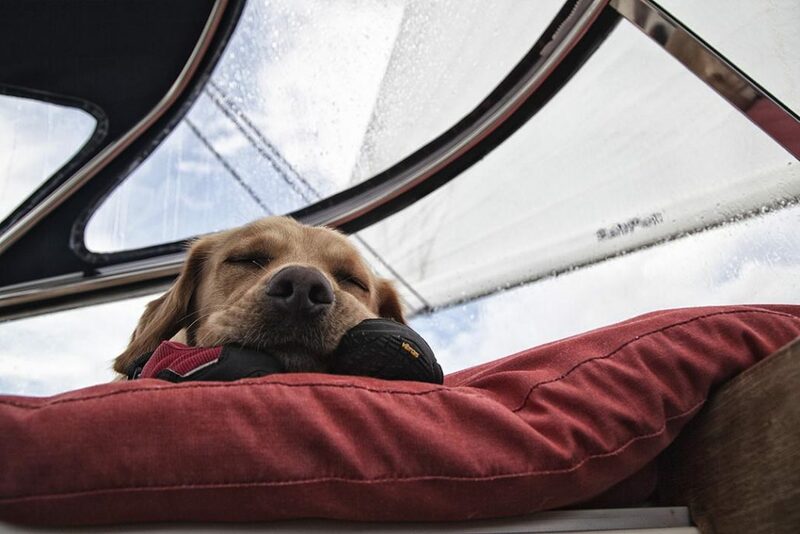 Whilst the Captain and his first mate take the helm, my priority is another nap. All is plain sailing until we hit a sea squall entering the harbour. The sudden gale force wind is howling round my ears like a wild dog. Despite my little shoes and sailing jacket, my sea-legs are feeble and I fear I’ll be washed overboard! Friendly faces with a Dutch accent, from a boat called Sirene, guide us to a safe harbour and help us moor up. Everyone is to-ing and fro-ing on this journey but we are all in this together. Ships that pass in the night, our paths cross briefly en route to our next destination. Back on Terra Firma, Mark and Karen are all set for a night on the town but there’s no room for dogs at the Inn. Putting on my best ‘hang dog’ look, I beg for a quiet night in. Back on board, we batten down the hatches. Thankfully Mark and Karen let sleeping dogs lie and I’m soon fast asleep and snoring loudly!